SINGAPORE - A brand of prepackaged salad leaves from Australia that is sold in Singapore has been recalled due to contamination with salmonella. 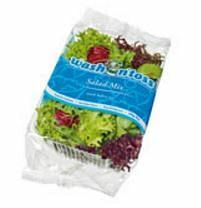 'Wash N Toss' salad leaves, produced by Tripod Farmers, has been recalled, the Agri-Food and Veterinary Authority of Singapore (AVA) said in a statement on Saturday (Feb 6). The batches affected have Use By dates up to and including Feb 14. Consumers who have purchased the product should discard it, AVA said. Recalled items include watercress, sorrel, baby cos, baby spinach, salad mix, wild rocket and kale. They can come in pillow bags or punnets of 50g to 1kg. The Food Standards Australia New Zealand earlier issued an alert that selected batches of prepackaged Woolworths, Wash N Toss, Coles, Supa Salad and Clear Film brands of salad leaves were recalled due to salmonella contamination. Of the brands, Wash N Toss was imported into Singapore, AVA said. The food safety agency instructed the importers to recall the implicated products from the market immediately. The recall has since been completed, AVA said. Tripod Farmers said in a press release that it is working with the Victorian Health Department to determine the cause of salmonella detected in three samples of its products. "We apologise to our customers and anyone affected by this recall, and are doing everything possible to ensure the health and safety of consumers and the integrity of our products," managing director Frank Ruffo said. Salmonella can cause nausea, diarrhoea and abdominal cramping. Those with weakened immune systems, including babies and old people, are more likely to be infected.